BELIZE CITY, Thurs. Apr. 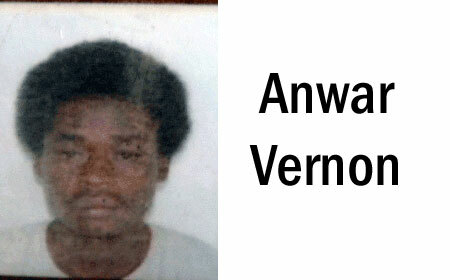 14, 2016–The Vernon family of Racoon Street, Belize City, is mourning the death of Anwar Vernon, 31, a laborer and the stepfather of two boys, 2 and 3 years old. He died at about 2:30 yesterday afternoon at the Karl Heusner Memorial Hospital, where he fought for his life for about 6 days after being attacked by unknown robbers who stabbed him and beat him in the head, then threw him into a drain on Racoon Street Extension, where he was found. On Wednesday morning, April 6, people walking on Racoon Street Extension saw him lying in the drain and called police, who went to the scene and saw Vernon battered, bleeding and unconscious. He was then rushed to the Karl Heusner Memorial Hospital, where he was taken to the Intensive Care Unit, where he battled for his life until yesterday evening, when he died of the injuries. ACP Chester Williams said that police have started a murder investigation into this death, and are awaiting the result of a mandatory autopsy to certify the cause of death. He said that police are still trying to find out what actually happened. A cousin of Vernon’s told Amandala that he strongly believes that Vernon was beaten and robbed of money because he had the money to pay his rent with him that Tuesday night and was drinking with some men. His girlfriend, Tara Matura, said that they had been living together for a year, and in remembering him, she noted that he was friendly and easy to get along with when he was sober, but when he was drinking he was difficult to deal with. He loved to work and got along well with the two boys, who loved him, she said. No one has yet been arrested for Vernon’s death. A post-mortem on Vernon’s body was being conducted this evening at press time, and the results of that exam are not yet known. Funeral arrangements have not yet been made. Anwar Vernon is survived by his common-law wife, Tara Matura; his two stepsons; his father, Toney; and a host of other relatives and friends.